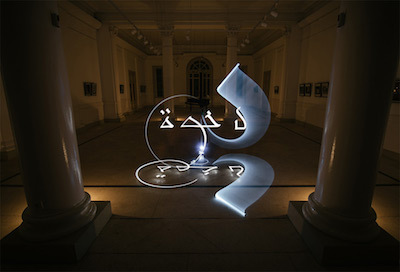 By chance I saw a video of Julien Breton (aka Kaalam) painting with light. I was mesmerized. Julien is a French, self-taught calligrapher. 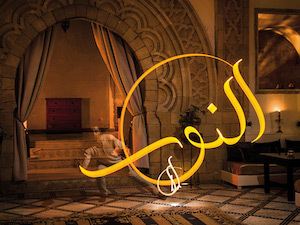 He worked mainly on paper for 10 years before he started creating calligraphy with light. He invented his own alphabet that is French but combines Latin script with the fluid, curving lines of Arabic as seen in the above pictures. He was also strongly influenced by graffiti abstraction and Asian body and mind techniques. To create a light painting, Julien works with a photographer to capture the images over a long exposure time — his image is not seen or is barely a shadow (see above picture). It takes “total concentration, with one chance to paint rapidly.” He practices for many hours using the Asian body and mind skills he learned before he creates the finished work of light painting. Julien's intention is to bridge cultural barriers and create community through art. © 2019 Practice of Immediacy in the Arts®. All Rights Reserved.